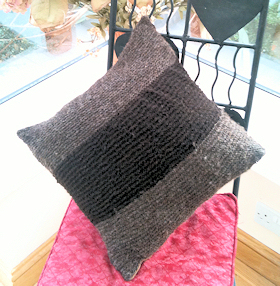 Hand Made 100% Rare Breed Wool Cushion. Made using the wool from our Hebridean Sheep. Hand Spun, Hand Knitted. The exclusive design of this "one of a kind" cushion has been made using wool from three different sheep and so shows the fantastic variety of colours featured in Hebridean Fleece. Suede Backed. 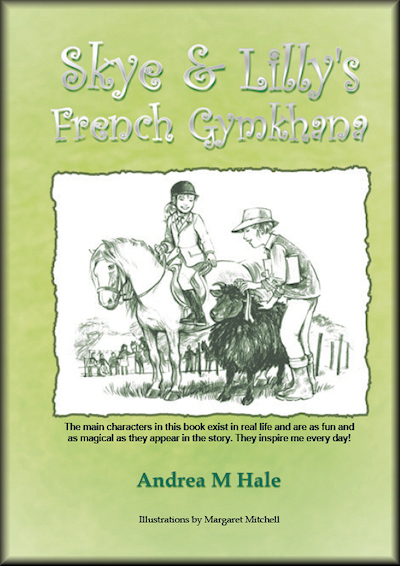 "Skye & Lilly's French Gymkhana"
Wonderful tale of friendship, support and trust between Skye, a welsh mountain pony and Lilly, a rare breed Hebridean Ewe. The unlikely best friends regularly join forces to win rosettes at gymkhana competitions but their skills are really put to the test in this thrilling adventure. Their friendship and trust of each other become vital as they face kidnap, smugglers and a daring rescue! This fully Illustrated childrens book is the first in a short series of adventures featuring real life characters from Millfields Rare Breeds. Book also available from Amazon and other major online bookstores.